Despite a 2-5 record, the Boulder City High School football team has its sights set on a playoff berth. The Eagles can still reach their preseason goal of making the playoffs for a second straight year with wins in the final two games. “First, let’s get there,” junior quarterback Trenton Carmell said. “Then, anything can happen. Our focus this week is on beating Sunrise Mountain. We can’t get overconfident. We will worry about Chaparral next week. But we are aware that we can win both games and earn a playoff spot. The Eagles play their final home game Friday night against Sunrise Mountain. Tickets are $5 for adults and $3 for students. Kickoff is at 7 p.m. It has been a tough stretch for the Eagles. After a 2-2 start, they began league play with three consecutive games against unbeaten teams, Desert Pines, Virgin Valley and Moapa Valley. Now, with two weeks remaining in the regular season, those three teams are 20-1 and will qualify as the top three teams in the league. Boulder City is 2-5 overall and 0-3 in Sunrise League, but the Eagles can clinch a playoff spot with a win Friday against last-place Sunrise Mountain (1-6 overall and 0-3 in league) and a victory Oct. 25 in the season-ending game, at Chaparral (3-4 overall and 1-2 in league). Chaparral defeated Sunrise Mountain 34-13 Oct. 11 to move into the fourth and final playoff spot from the league. Boulder City can catch the Cowboys and edge them for that playoff spot by a head-to-head win. “We are going to win both games,” senior Sam Woodbury said. “As a senior, I am not ready for the season to end. Right now, making the playoffs is the main focus. All I know is that we are going to do everything and anything we can to make sure we win both games. On Oct. 11 at Overton, Moapa Valley defeated Boulder City 52-14 behind quarterback Zach Hymas, who completed 11 of 20 passes for 212 yards and three touchdowns. The Pirates are 7-0 and 3-0. Eagles’ senior running back Xavier Steel had 104 rushing yards, including an 80-yard run. “We will bounce back from our losses and make the playoffs,” junior wingback Brooks Roe said. Jordyn Syler, Mariah Harvey, Kelli Hatfield, Taylor Krumm, Lauryn Norris and Skylar McKay lead the Lady Eagles golf team at 11 a.m. today into the Division 1-A Southern Region Tournament at Boulder Creek Golf Course. The Lady Eagles play on the road tonight against Tech in a Sunrise League match before returning home Monday to play rival Moapa Valley. Currently, Boulder City (13-9, 6-0) is in first place, one game ahead of Moapa Valley (14-13, 6-1). “As always, it should be a great match up with Moapa Valley,” coach Cherise Hinman said. “We are currently the league leader, but that can change if we are not careful. We have made several lineup adjustments leading up to this point. 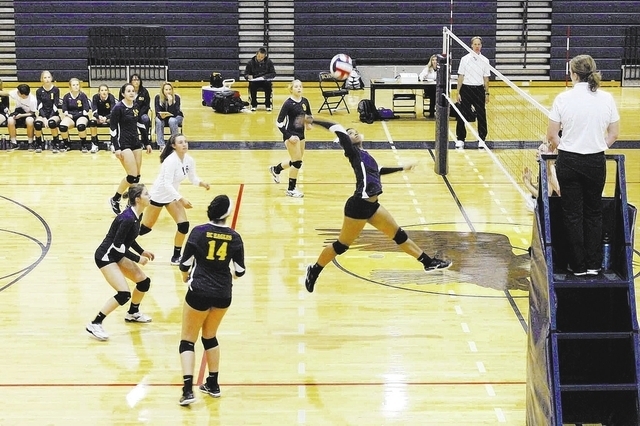 Boulder City played two matches at home Monday and Tuesday. They were scheduled to play Pahrump Valley on Monday and a league game against Desert Pines on Tuesday. The Eagles (3-8-1, 1-6-0) play today at Sunrise Mountain (5-2-2, 4-1-2) in a Sunrise League game, at 3 p.m. They return home on Monday to play Desert Pines. The Eagles lost 5-0 to Chaparral on Oct. 9. The Lady Eagles (3-8-0, 2-5-0) play at 3 p.m. today at home against last-place Sunrise Mountain (1-12-0, 0-7-0) in a Sunrise League game. They played Monday at Faith Lutheran. The Lady Eagles will take on Desert Pines in Las Vegas on Monday.